Bengaluru, India's IT and outsourcing capital, has of late been hosting marathons regularly and its citizens have been enthusiastically participating in them in large numbers. Scores of companies, particularly from the IT, ITES and Biotechnology sectors, participate in these marathons in large numbers for improving their brand visibility and team-building while effectively demonstrating their corporate social responsibility by associating with the city's issues. Mr. Subhakar Rao, Chairman, Champions Group said, "It is no coincidence that Bengaluru has achieved this distinction of being called the "Go Green Knowledge Capital? of the new flat world. It is the hard work, perseverance and tenacity of our young workforce who work day & night, round the clock to keep our economy growing. But, the city has become a concrete jungle and it's time to Go Green. It is time to make our city greener. 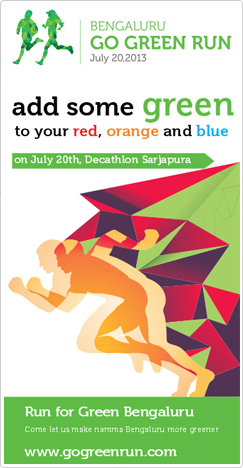 Come participate in the Go Green Run and each runner also gets to take home a plant."